We are currently members of the BBB! 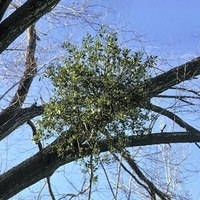 Did you know that mistletoe is a parasite? What most people don't know is that mistletoe is a parasite. Mistletoe can reduce the growth of your trees and with heavy infestation can even kill your tree. It takes water and nutrients from the tree. Most mistletoe is spread by birds. It is important to remove the parasite before it produces seeds and spreads. Chemical treatments of mistletoe are a temporary fix and can require multiple applications. Pruning the infected limb is the most effective form of treatment. Severely infested trees should be removed to protect the surrounding trees from infestation. Call us and one of our experts at Gordon's Tree and Crane Service will come out to see if you may be facing an infestation.